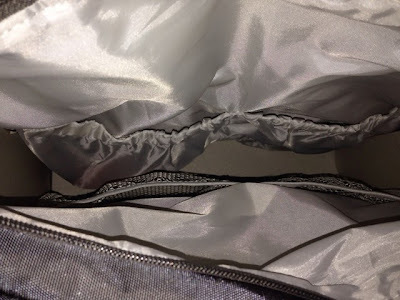 The changing bag that we were using was a beautiful Pink Lining Yummy Mummy bag. Yes, it was lovely but I'm sure Chris felt a bit awkward carrying such a girly bag when out on his own. 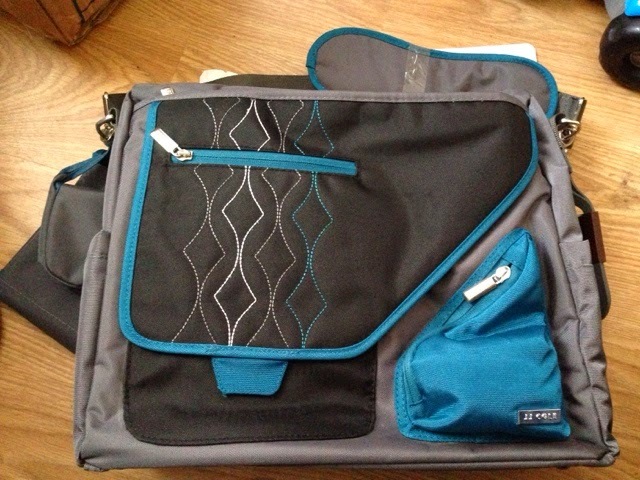 Enter the JJ Cole Metra Blue Diamond changing bag. 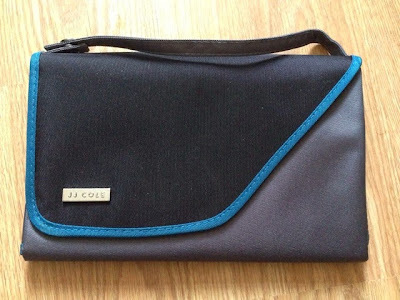 Blue is one of my favourite colours and combined with the grey and black, it makes the perfect unisex bag. 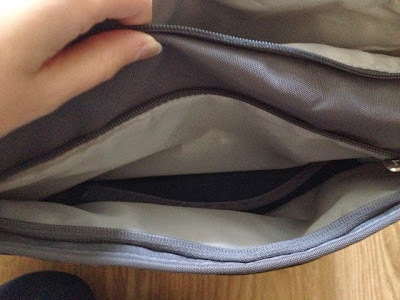 Firstly, it's a lot deeper than any other changing bag that we have used and we were taken aback by how many compartments it had. At the front we have a small zipped compartment and a larger zipped triangular pouch. 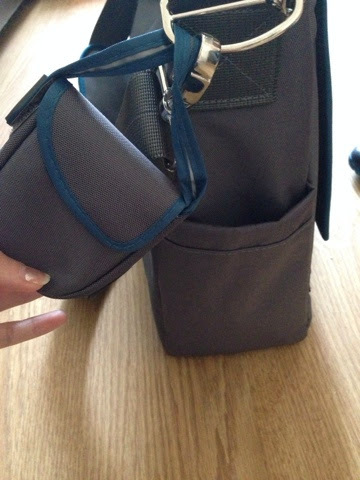 You are able to lift the smaller compartment up to reveal an area to keep little bits and bobs. The side have two insulated bottle holders and it even comes with a dummy holder! 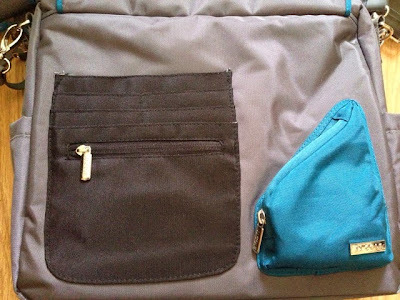 Inside the bag, we have the main area but it also has a variety of mesh and fabric pouches so that you can easily find everything. They are a generous size too. Directly in front of the main part, there is a slightly hidden zip. 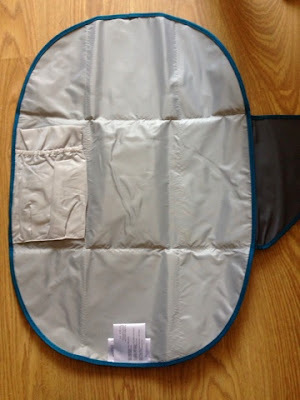 Again, this is really spacious and stores the changing mat. The mat is very compact but opens out and even has a pouch to hold a nappy and wipes. 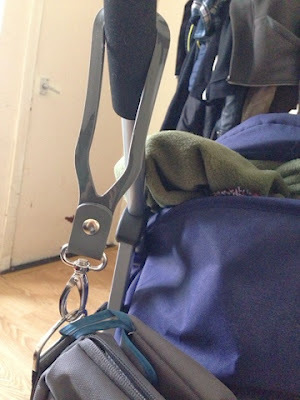 The shoulder strap is padded and extendable but my favourite but about the bag is the stroller hooks. I'd never seen them before but they are genius!! It is a really gorgeous bag and I think it's the first one that Chris has genuinely liked - hurrah! It's easily wiped clean and has plenty of space. What more could you ask for!? The JJ Cole Metra Blue Diamond changing bag retails at £54.99 and you can purchase it here.